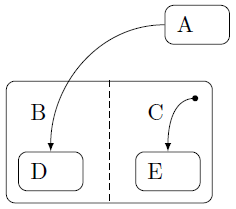 where there are two top-level states: A and B|C (state with two orthogonal regions B and C, divided by a dashed line in the middle of state); B has a nested state D, whereas C has a nested state E; interlevel connections should be possible, i.e. a directed connection between A and C.
Not the answer you're looking for? Browse other questions tagged tikz-pgf nodes nesting or ask your own question. 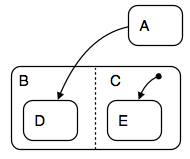 How to nest a graph within a node in TikZ and draw edges between the graphs?